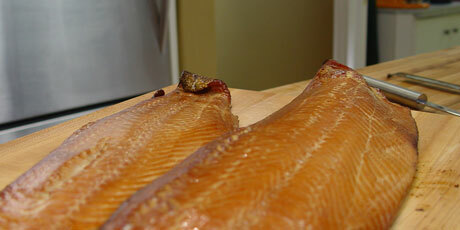 Michael Smith shows you that nothing beats smoked salmon made in your own backyard! 1. Soak the wood chips overnight, or at the very least, for an hour. This slows down the smoke. 2. Whisk together the water, salt and sugar until they dissolve and form a brine. Place the salmon skin side up in the bottom of your picnic cooler and pour in the brine. For best results, soak overnight; or a minimum of four to six hours. Turn the fish every few hours. If need be, you may cut it into smaller pieces to fit in a smaller picnic cooler. 3. Pre-Heat half of your BBQ grill to high. Remove the grates from the hot side. Drain a handful of the wood chips and toss them into a small cast iron pan, onto a cookie baking sheet or any metal baking pan that you are prepared to dedicate to smoking. You can also form a foil tray or foil package. Place the chips on one half of the grill, directly on the baffles below, as close to the heat as possible. When they get really hot, they will start to smoke. Once they do, turn the heat down just to the sweet spot that maintains the smoke but doesn’t catch the chips on fire. Close the lid. When the internal temperature hits 250° it’s ready. 4. Remove the salmon from the brine and dry it off. Lay some foil on the other side of the burner, Position the salmon on the foil. Close the lid and smoke for about two hours. Continue adding wood chips and keeping the smoke chamber full. If the chips catch on fire spray them lightly with the mister. 5. When the fish is done, when it’s infused with the awesome flavour of hard wood smoke celebrate. Welcome to an ancient culinary guild! Celebrate and share. But save at least one side of the salmon. Wrap it in plastic film and refrigerate it for at least 24 hours or even a few days. Like anything smoked the flavour improves, mellows and matures with time. 6. When it comes to food safety you’re on a mission. 160 degrees for 30 minutes. When the salmon hits and holds an internal temperature of 160? for half an hour it’s safe, it’s cooked. You can continue smoking, adding flavour, but now you know the fish is safe.